In the Jean Paul Sartre novel Nausea (La Nausee) the protagonist, Antoine Roquentin comes to terms with his own existence. No longer able to subscribe to the conventional ways through which our lives are supposedly given meaning, Roquentin confronts the possibility that there is no meaning to life. This realization nearly drives him insane, but in the end, he's found that in this realization lies mankind's true freedom. Our life has the meaning that we make for ourselves. It is a frightening freedom and one that compels us to act in meaningful ways or find ourselves leading a meaningless life. Chad Stock may or may not be the greatest existentialist winemaker that there is. Frankly, he may not even be an existentialist, but Chad's project, Minimus certainly eschews wine-making convention. And like Sartre's Roquentin, Chad seeks to make his own meaning through a completely experimental set of wine-making rules. I came upon the wines of Chad Stock by accident. I found No. 1 in a Carlton wine shop. The label looked like a technical journal, and it simply said No. 1 Robinia pseudo acacia and below that in parentheses (Black Locuse.) I didn't know what the hell that even meant. I asked the store clerk, "What's this about?" "Man, that is just cool. Acacia barrels, it's Viognier and Sauvignon Blanc." Eyebrow raised. The wine was weird, and it was so delicious. Completely unique. The aromatics were full of fruit, flowers and a kisses of acacia wood. The wine was unlike anything I'd ever had from Southern Oregon, lean and angular at some moments, round at others. It was in a way, kind of bizarre, but it was undeniably wonderful. What little I was able to find out about the wine was that the winemaker had wanted to tinker with acacia wood because it was used in some of the wines he favored from Austria. He sourced the fruit from a little known Stella Maris vineyard in Southern Oregon. I reached out to Chad the evening I had the wine. It took some digging, Minimus didn't have its website yet, but he was eager to talk about his project and I was eager to hear more. It would be about six months though before I would have the opportunity to pay him a visit. Chad is a stout guy, with close cropped hair and a goatee and he's the kind of guy who wear shorts in the cold. I say that because the day he and I met it was cold, and he was wearing shorts. At the winery where he works in the Willamette, Chad is employed as a general manager, but he also gets to work on his own project there. 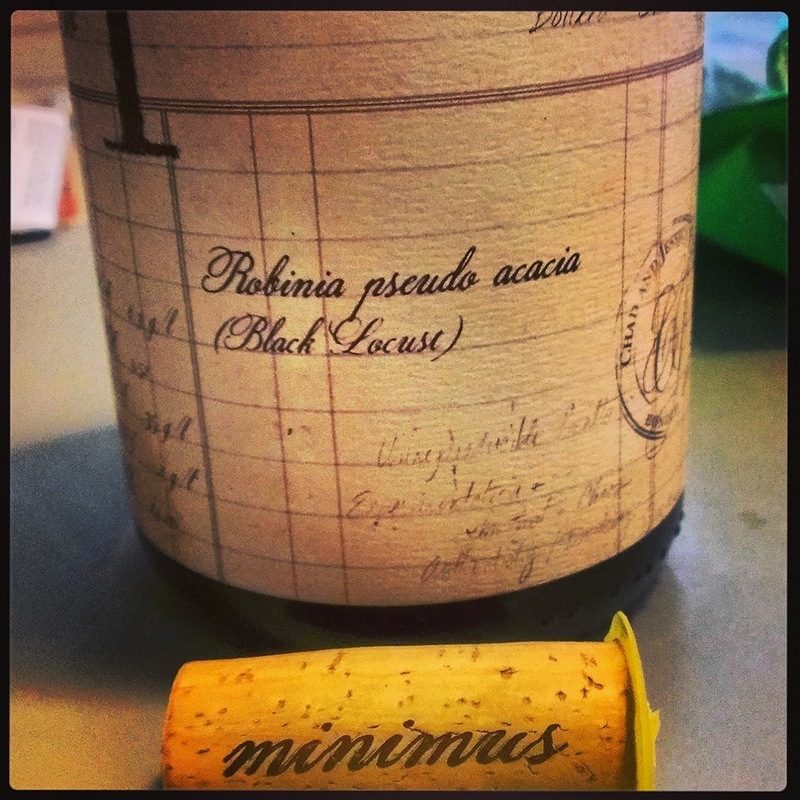 Minimus is about Chad Stock's development and education as a winemaker. Chad is very measured, he's quietly intense and intellectual. He doesn't make off the cuff bombastic remarks, he's not the least bit self congratulatory. He appreciates all that he's learned and those who have taught him. He doesn't mean to slight any of the hard work that has been done by the pioneers who came before him, or disrespect those who have taught him so much. His pedigree, schooling, experience and resume are very impressive. Big names and prestigious producers in Napa and some of the rising cult wines of the Willamette Valley. Minimus though, isn't about cashing in on Chad's track record. "I appreciate everyone who taught me, but I'm not sure the traditional academic approach really prepares you to make wine." Minimus is instead pure experimentation, there is no other agenda, simply learn by doing. Chad's production is minuscule at this point with some wines resulting is as few as 20 cases, so hardly a huge money making endeavor. Chad wants to learn as much as he can and he's not concerned with what convention tells hims he should and should not do. There is no style, each bottling is a single experiment, it will not happen again. "The first wines I made were scientific experiments." This includes, No. 1, No.2 Co-Pigmentation, (which sadly I did not get to try) was an experiment fermenting Tempranillo with Viognier skins. No. 3 19 Days & No. 4 43 Days, ( I found them at a shop in Portland but have yet to open.) No. 3 is a Viognier that was left in contact with the skins for 19 days and bottled with lees. The experiment was conducted to understand skin contact and white wines. Given the hot vintage and the lack of acidity in the Southern Oregon Viognier, Chad also used skin tannin to test a hypothesis he had. That tannin can sometimes mimic acidity. No. 4 was to further push the boundaries of skin contact and challenge the convention that skin contact could diminish varietal character. "The next set of wines I'm releasing are social experiments." No. 5 Reduction, which Chad and I tasted on my visit is a blend of Pinot Noir and Blaufrankisch (Lemberger) from Johan Vineyards. When a wine is referred to as reduced, it is often considered flawed. In production Chad had encountered a reduction taking place in one of his fermenters that he frankly really enjoyed and so he let it take its course. The reduction which he had analyzed upon bottling, is 15.7 ppm of dimethyl sulfide is commonly found in aged red Burgundy. The wine was a wonderful combination of earthen aromatics classically Willamette and fresh red fruits. Chad sent me home with the sample bottle, over the next couple days it transformed in such a way that it could have easily been confused with a wine that has been cellared for ten years. To steal a quote from Chad from the video below. "Who cares if it's flawed if it's delicious." Chad Stock & Minimus Wines from roboshow on Vimeo. Chad is also experimenting with various fermenters, he has wines in acacia wood, concrete and when I visited him he was putting some Gruner Veltliner into a freshly made clay amphora. The original wine fermenter of the ancient Greeks and Romans. This one crafted in the Willamette Valley by Andrew Beckham of Beckham Estates. A lot of thought goes into the pricing. "I believe the price of the wine communicates something." Chad is very careful about that perception, and his pricing. All of the wines are priced in and around the $20-30 range. In the same vein Chad does not seek to have the wines scored, or even reviewed necessarily. He does not submit them to wine writers. I bought his wine in a shop and eventually tracked him down, he didn't reach out to me. All of those things, the price and certainly number scores or reviews associated with the wines create preconceptions that could cloud the experience that is tasting the wine. In Chad's estimation, that can get in the way. Wine is seen, rightfully as a combination of science and art. Chad, in Minimus falls firmly into the latter category. He draws inspiration from winemakers who were innovators, like Paul Draper, the late Didier Dagueneau as well as Walla Walla's Christophe Baron. I haven't met those guys, but Chad Stock is easily the most imaginative person I've met in the wine industry. If you like safe and predictable, keeping it in between the lines, these wines are not for you. If you're dogmatic about what you think a wine, or a region or proper wine-making should be, these wines are also, not for you. If you believe that wine can be eye opening and has the ability to teach us about people, and nature and if you think it's possible for things that are weird to also be delicious. Well in that case, I urge you to find the Minimus wines, you'll enjoy the hell out of them. Thanks for the enjoyable write up! Chad is one of my favorite wine makers to chat with. Thought you might enjoy our video series with Chad - wish I had seen this before we sat down to help formulate questions. Ignore if this posted twice. You should have met the late Michael Moore of Blackwood Canyon. Very similar approach to winemaking. For those of you who knew Michael at the end those wines were not representative of his 25 years of wine making. I think I'll have to visit Chad.